Basically, it’s as little or as much as you can do. We need help on Feast days to keep it all running smoothly and during the month behind the scenes, with things like the website, sponsorship, marketing and outreach. In return you get to work with a lovely team of local people as well as getting valuable experience for your CV! Assistant hub leaders to help with the admin, the booking of the stalls and set up on the day. Volunteers for the Tea & Talk Table at Artisans on Chatsworth Way (where older people in the West Norwood community come each Feast for a free cuppa and slice of cake, and a chat to a lovely Feast volunteer) – is this something you would enjoy? Sponsorship & Funding – if you are good at getting money out of people, we need you! Marketing, Press & Publicity – we have a hardworking Feast team and they always need a hand. Entertainments – coordinating performers on the day and helping out with children’s activities. Website – we need someone who is WordPress savvy who can help us with the technicals. 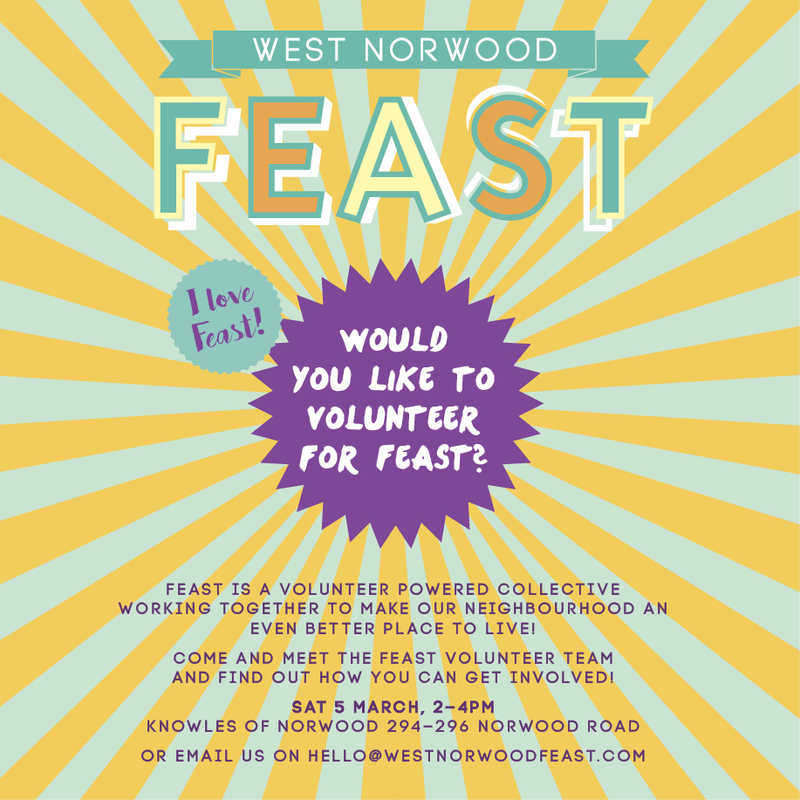 Outreach – if you have connections to communities or businesses in West Norwood who Feast could reach, help us! Feast starts again Sunday 3 April!